Anyone who knows the storied history of Route 35 in the region of our restoration project knows that what we’ve done there is far superior to what was in place before Superstorm Sandy. Criticism of this project comes from those with little or no knowledge of the many problems that the region faced due to constant flooding and pervasive drainage issues. The past few weeks have seen a lot of information and misinformation circulated concerning the pump stations included in the Route 35 reconstruction project. The New Jersey Department of Transportation’s (NJDOT) goal is to rebuild a road and make the area as secure as possible for years to come. These pump stations are an important component of the overall project. Route 35 was severely damaged by Superstorm Sandy. NJDOT did not stop at just repairing a roadway, the Department sought to ensure that this never happens again. In doing so, we needed to alleviate the impact of flooding on the area. The $341 million project totally reconstructed 12.5 miles of Route 35. To protect this new roadway, a storm-water drainage system for Route 35 has been designed to handle 25-year storms and features nine pump stations and treatment facilities to filter and purify the storm water prior to discharge into Barnegat Bay. When fully operational, storm water will be drained off the street, circulated through a filter system, then drained safely AND cleanly into the bay. This is a first for the region. Before the pump stations, a significant rainfall like we experienced last week, would have caused flooding, with water from the street draining directly into the bay bringing with it any debris and materials it picked up along the way. Thanks to the pumps, these garbage and contaminants will no longer find their way into the bay waters. It is important to remember that this is an ongoing project. Much of the unfounded criticism relates to elements of the drainage system that are not yet complete. We are continuously making tweaks and adjustments to the system to ensure the pumps are set to correctly respond to appropriate water levels. As we work on sealing the entire system, ground water will infiltrate some of the pipes during the process. This water activates the pumps, which is why they have been running more often than they will once the project is complete. NJDOT is meticulously sealing 60,000 linear feet (nearly 12 miles) of pipe to ensure that, upon completion, there will be no further ground water infiltration. But we know the system is working. The area received substantial rainfall last week and the pumps activated properly. The water on the streets drained quickly and was pumped into the bay after being filtered clean. 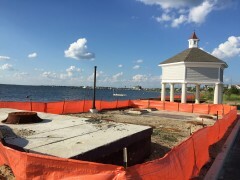 This project is expected to be completed later this fall. In the interim, NJDOT will continue to work closely with local residents and officials to ensure this project accomplishes all of its goals. NJDOT has a robust community outreach effort that includes a hotline telephone number, 732-230-7356, and email address, restore.nj35@dot.state.nj.us for residents to pose questions or provide suggestions as work progresses. The Department also has a project-specific website that provides information on the construction activity.